Avengers Assemble! It’s time for iced tea. – You really can’t call yourself a superhero until you’re drinking out of these bad boys. 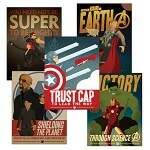 Marvel Comics Avengers Propaganda Poster Set – Okay, so I have a thing for posters (who’s keeping track, though?). I love the vintage-like designs on these posters, especially on Captain’s. 🙂 No longer available. Sock It To the Bad Guys – Superhero socks with capes? I mean, come on! Marvel Iron Man 3 LED Arc Reactor Ring – Everyone needs an arc reactor in their life. Well, preferably one that’s an awesome ring and not one that’s inside of you. (Unless you’re into that sort of thing). No longer available. DC Comics Men’s Batman Mask Peruvian with Ears – This is the ultimate winter hat. Imagine hearing a voice call for help while you’re walking to your car, but you don’t want to use your superpowers in public. Slip on this mask to not only protect your identity, but also to keep warm during those cold winter nights. Green Lantern Insignia Ring – In brightest day, in blackest night, no evil shall… Frak it. I’m going to use it to make dinner while I play “Arkham Origins.” No longer available. Captain Hammer T-Shirt – Like it or not, he was a superhero. Just try not to get sent to human resources by asking people if they know what the hammer is. Batman Apron – So, those magazines at the grocery store check-out lanes tell me that there is nothing more attractive than a man who knows his way around the kitchen. Wrong. There is one thing. Batman. So, ladies? Care to chime in? DC Comics Deck Building Game – I know I included this in the Gamer list, but oh well. It’s fun, fairly easy to pick up and learn, and fun! Yes, I know I said “fun” twice, because it’s fun. Iron Man 3 Deluxe Hero Tony Stark Light-Up LED Shirt – For those who like their arc reactor’s in their chest, here’s the closest you can get without having to get shrapnel inching towards your heart. Chocolate Gaming Dice Set – People love candy in their stockings, and Geeks love dice. This is a winning combination! – Tony No longer available. Good luck to everyone in their last-minute shopping, and I hope you all stay safe and warm this weekend! Disclaimer – This list, like every other Christmas list posted on blogs right now, is chock-full of affiliate links for Amazon, which will hopefully slowly earn us enough money to live the life of Bruce Wayne or Tony Stark, but in reality might buy us domain name renewal and a beer. Thank you for your support!